Humans have a natural interest in animals; through a long history of domestication, they have become tools, a food source and even friends. Behavior is a significant indicator of animal health and well-being, and understanding this behavior is therefore the key to good management. 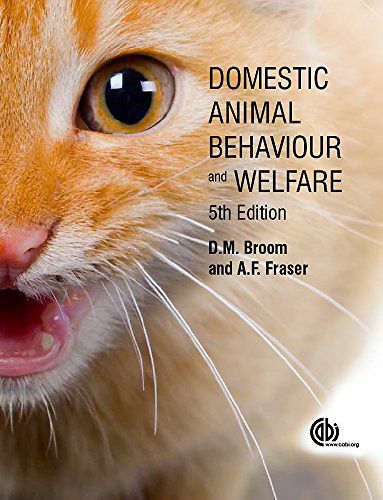 Covering all aspects of animal behavior and how this relates to welfare for companion animals, farm animals and farmed fish, this book reviews development, socialization, locomotion, reproduction and more. It takes a comprehensive approach to the subject, including a section of chapters addressing common abnormal behaviors and reviewing some animals, such as rabbits, from both a pet and farm perspective. Now in its fifth edition,Domestic Animal Behaviour and Welfare includes new chapters detailing the welfare of sheep, goats and exotic pets, and welfare in relation to genetic selection and modification. Animal behavior and welfare sciences are now core topics for agriculture and veterinary students, with courses and research opportunities in this field growing world-wide. Fully updated and with new photographs, this indispensable textbook provides a student-friendly guide to the major themes of animal behavior and welfare.